2.Combine the eggs, cashews, milk, honey, and melted coconut oil in a blender. Blend until very smooth and creamy. I sometimes have to stop the blender a few times and scrape the sides to make sure all the ingredients are mixing well together. 3.Add the salt, baking soda, and coconut flour, then blend again until the dry ingredients are incorporated into the wet. Mix in the blueberries with a spoon just before pouring on waffle maker so they don’t get blended up and turn the waffles blue. 4.If your iron requires oil, spread a little coconut oil on both sides. Pour the batter into the waffle iron so it just covers the bottom portion of the iron, being careful not to overfill it as these do rise quite a bit and will spill over. 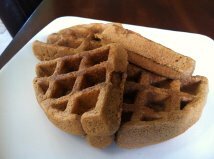 5.Cook the waffles for about a minute, more or less depending on the heat of your waffle iron. If they release easily with a fork when you open the lid, they are probably done. 6.Repeat until the batter has been used up.